The beer market in booming; perhaps not in quantity but at least in variety. Market research shows indeed uprising trends in all European countries. In today’s article we deliver some intertesting facts and figures for the UK and italian craft beer markets. Beer and Brits : that’s a true love story, isn’t it. Visiting pubs after work is a real british tradition and the cement of business relationships. Market trends show that it’s not only about quantity. It’s also about diversity. The same uprising market trend can be observed in other European countries. 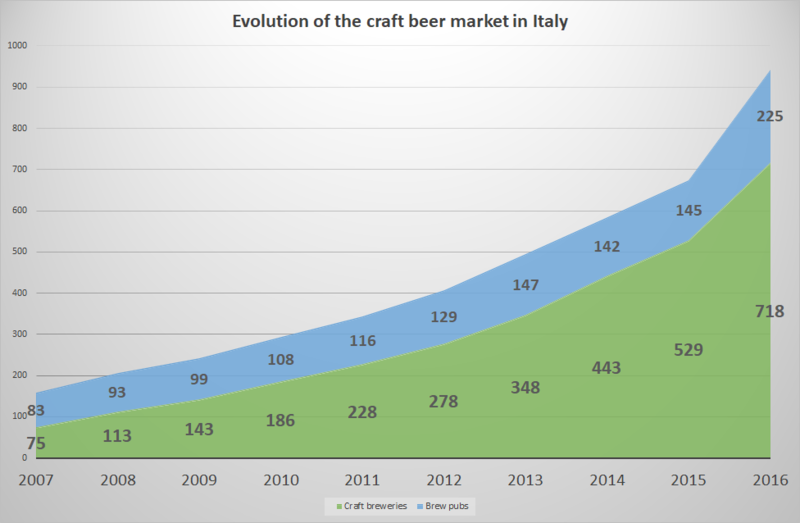 In Italy for instance there were 75 craft breweries in 2007 and there were 718 in 2016, which represent almost a 10-fold increase. Obviously the market remains dominated in volume by big brands. But consumers show a lot of interest in new tastes, authenticity which results in local micro-brands being created. Large organizations like AB Inbev for instance have very reognized this trend and have long been investing in local brands to build up their portfolio. One very successful example is Belgian microbrewery “the Brussels Beer project” which crowdfunded its launch and has now a full range of attractive products that are also available on retailers’ shelves.